Raheem Edwards (born July 17, 1995) is a Canadian soccer player who currently plays for Chicago Fire in Major League Soccer. Edwards generally plays as a left winger or wing-back. In 2015, Edwards signed his first professional contract with Toronto FC II, Toronto FC's reserve team. He made his debut as a substitute on March 28 against FC Montreal. Edwards played two full seasons with the USL side, scoring eight goals and assisting on five occasions. In June 2016, Edwards signed a short-term agreement which allowed him to play in cup games with the first team. On June 29, 2016, Edwards made his first team debut during the 2016 Canadian Championship, coming on for Jonathan Osorio in the second half of the second leg of the final. Raheem made his Major League Soccer debut when he entered in the 88th minute TFC's 1–1 draw at home to Seattle Sounders FC on July 2, 2016. In March 2017, Edwards signed a full first team contract with Toronto FC prior to the 2017 season. On December 12, 2017, Edwards was selected by Los Angeles FC in the 2017 MLS Expansion Draft. He was then immediately traded with fellow expansion draftee Jukka Raitala to Montreal Impact on exchange for defender Laurent Ciman. Edwards would make his Impact debut against the Vancouver Whitecaps during the 2018 season opener, and would score his first goal for the Impact in the following game against the Columbus Crew. On July 17, 2018, Edwards was traded to the Chicago Fire in exchange for $400,000 in Targeted Allocation Money. He made his debut four days later on July 21, assisting on a Nemanja Nikolić goal in a 2–1 defeat to his former club Toronto FC. Edwards made his debut for the Canadian program with the U23 side at the 2015 Pan American Games. He appeared in his first match against Brazil's U23 side as a substitute. In May 2016, Edwards was called to Canada's U23 national team for a pair of friendlies against Guyana and Grenada. He scored in both games, and received Man of the Match honors with a goal and three assists in the U23's 5–1 victory against Guyana’s full national team on May 15, 2016. 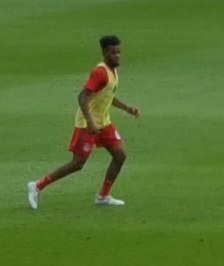 Edwards made his debut for the Canadian senior team against Curaçao on June 13, 2017. On June 27, he was named to the 2017 CONCACAF Gold Cup squad. ^ Hylton, Kamal (March 28, 2015). "Match Recap: TFC II vs. FC Montreal". ^ "Toronto FC Sign Raheem Edwards To Short-Term Agreement". Toronto FC. June 29, 2016. ^ "Toronto FC sign Raheem Edwards". Toronto FC. March 2, 2017. ^ Charles Boehm (March 4, 2018). "Vancouver Whitecaps 2, Montreal Impact 1 | 2018 MLS Match Recap". MLS. ^ Phil West (March 10, 2018). "Columbus Crew SC 3, Montreal Impact 2 | 2018 MLS Match Recap". MLS. ^ Squizzato, Daniel (July 12, 2015). "Stylish Brazil makes Canadian men suffer in Pan Am football". ^ Canada Soccer Association. "Canada announces roster for Caribbean tour". Retrieved May 19, 2016. ^ Canada Soccer Association. "Canada m23 defeat Guyana as part of Jubilee celebration". Retrieved May 19, 2016. ^ Canada Soccer Association. "Canada m23 wins again on Caribbean tour". Retrieved May 19, 2016. ^ Beacon, Bill (June 13, 2017). "Canada beats Curacao for first win under Zambrano". ^ Zeitlin, Dave (June 27, 2017). "Canada names nine MLS players to 23-man CONCACAF Gold Cup roster". ^ Soccerway. "Raheem Edwards profile". ^ "Raheem Edwards profile". Canada Soccer. Retrieved March 24, 2018. Profile at Canadian Soccer Association.